Thank You for your sacrifices, your patriotism and your willingness to protect others! This group starts with the World War II veterans and continues to current service personnel engaged in a global war on terrorism. Among the WW II vets is my dad who will visit us this next week and stay for Thanksgiving. His stories of driving heavy equipment in England are always harrowing and the focus of getting the job done (despite broken equipment and schedule challenges leading up to the D Day invasion) was typical of our service members. I remember being so impressed during a landing with a C-17 at Kandahar in Afghanistan early in the war there to see the runway lined with foxholes and young marines in each one. It was December 2001 and they had secured the runway so we could bring in supplies and other service personnel. It was bitterly cold with no comfort features that most Americans take for granted. They served with pride. I also remember an aircraft maintenance crew that volunteered to sleep on a glacier with a helicopter involved in the rescue of injured personnel from another country. The helicopter needed maintenance and repair. It was a large job and they were almost on the Arctic Circle but they wanted to be there! I had to turn down volunteers. 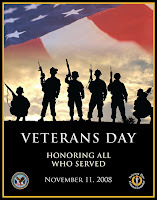 So if you know a veteran or their family please say thank you on this special day of recognition. They certainly have earned it! PS: We are preparing for a new president and congress and we need to remind them of the sacrifices of this group to protect all Americans. We, the people need to insure that the political leadership continues to provide and even improve the benefits that veterans deserve.